Human and environmental heaths are intrinsically connected. As humans are the dominant species on Earth, the environmental health of our planet relies on human actions and behaviors. Conversely, human health depends on the planet’s ability to provide adequate and sufficient resources for humans to survive and thrive such as water, oxygen, soil, food, and other essential nutrients. A whole food, plant-based diet accompanied by lifestyle factors such as sleep, exercise, stress reduction, and sunshine are the basis of a healthy human body. A plant-based diet is also the most significant lifestyle habit toward reducing global warming, and improving the health and future of the planet. The Iceberg is the graphical depiction of two health ecosystems working as one toward achieving human and planetary sustainability. 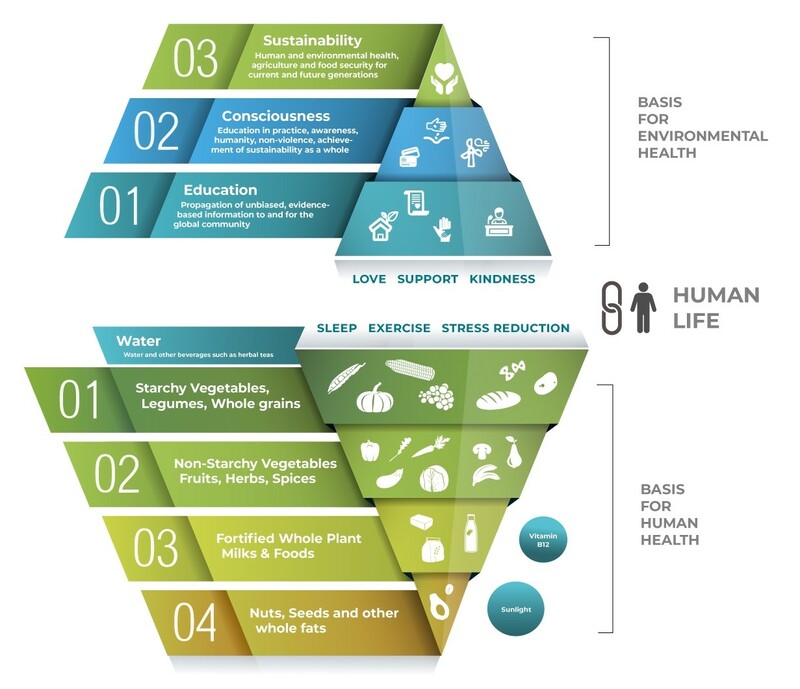 The basis for human health (bottom structure) describes the configuration of a well-planned whole food, plant-based lifestyle that involves a state of complete physical, mental and social well-being and not merely the absence of disease. The basis for environmental health (top structure) describes the phases to arrive to education and consciousness levels that when applied to entire communities creates global impact. An iceberg is a representation of the wonder and beauty we see on planet Earth. The iceberg is also a perfect symbol of human health and its connection to the environment. As we know, a plant-based lifestyle can be a major solution to global warming as well as a solution to many human diseases, which makes these two aspects completely interconnected. The part of the iceberg that is visible above the surface of the water; usually about 10% of the whole structure. Beyond the physical aspect of health, it is necessary to create awareness by educating and empowering the global community. The ability to make educated choices is the ultimate game-changer. About 90% of an iceberg is below the surface; its lifespan depends on the size and strength of the structure below the surface. The iceberg is also a reminder of the fragile state of our environment. If global warming continues, humans will not have a planet on which to live; icebergs, as well as human life, will disappear. A plant-based diet accompanied by other lifestyle factors is the basis of a healthy human body. prevent and reverse both environmental and human destruction. as well as the solution to human disease. Just like humans, icebergs harbor their own complex ecosystems, and they shape the ecosystems through which they pass. 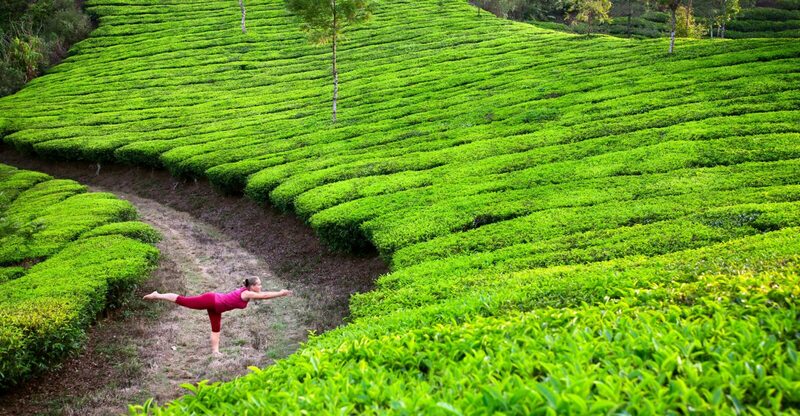 We have the power of building ecosystems and crafting ideal environments that establish health on a global scale. Human and Planetary Health Outcomes. Education is the key to create an educated society that chooses consciously instead of following marketing trends that benefit big and/or unsustainable industries. The ability to make educated choices is the ultimate game-changer. Consumers have the power to create demand for the products and services that best fit their needs. Creating demand for sustainable, non-toxic, and non-polluting goods in manufacturing and consumer markets, paves the way to a financially strong and sustainable socio-economical future. The iceberg a reminder of the fragile state of our environment. Global warming is melting icebergs, changing habitats, and altering sea levels. If global warming continues, humans will not have a planet on which to live; icebergs, as well as human life, will disappear. Animals produced for human consumption are exploited and abused. A WFPB lifestyle is non-violent, kind, and conscious, as it does not require any animal use. Furthermore, it is non-violent toward the environment as it helps reduce environmental degradation by drastically reducing water and land use, deforestation, water and air pollution, biodiversity loss, and greenhouse gas (GHG) emissions. This is a call to action that benefits everyone. We can be remembered as the generation that changed the course of history, the one that connected the dots and made the leap that no other generation was able to do for the continuity of life on planet Earth. A plant-based lifestyle creates sustainable demand for foods that prevent and/or reverse acute, chronic, and degenerative conditions that are the most common causes of disease and death globally. This demand empowers farmers to position themselves at the top of the market instead of the bottom. By diminishing the demand for animal products, we can effectively reduce the production of greenhouse gases, reduce land use, and improve the health of our waterways and oceans. All this can improve global health like no other action can. By demanding organic crops produced through conscious and renewable agriculture and permaculture (chemical and GMO-free practices) we will build systems that are profitable and beneficial for all. Donate to our causes, gift a land plot or other real estate, or choose our charity while you shop through AmazonSmile.